It looks like DAX 30 (German Index) has just completed an A-B-C corrective Wave 4 (The circled Blue Wave iv) and hence we can expect good upside in the coming sessions. From an alternate perspective it is also possible that the Wave iv of Wave (c) is still continuing as a Triangle or some other corrective structure, hence it would be best to look for longs only after the break of the Green Trigger line 12308 level to the upside. The exact confirmation of the new leg up will only come after the break of the Blue upper channel line. 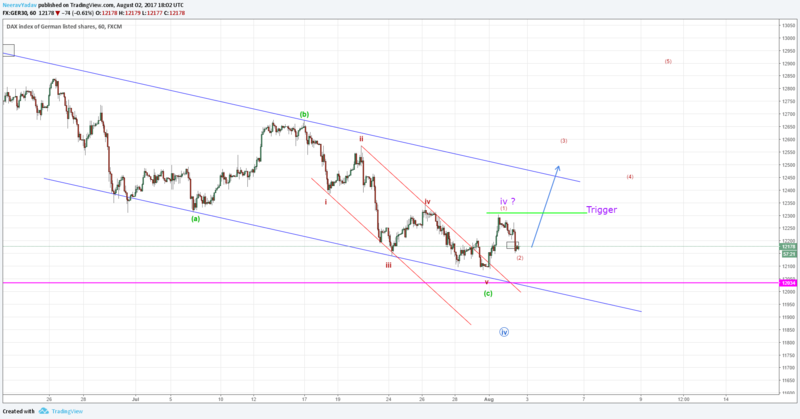 Even if the Wave iv (Blue circled) is continuing as a Flat, we still have a good trade setup here to look for longs untill atleast the all time highs of 12960. I will update further as this market continues.